The Japanese government indicated Tuesday it is ready to support France in repairing Notre Dame Cathedral, as officials and celebrities expressed their sadness at the fire that has badly damaged the iconic Catholic church in Paris. Prime Minister Shinzo Abe sent a message to French President Emmanuel Macron, saying that he was "greatly shocked" to see the famous cathedral engulfed in flames. "Our hearts are with France at this time of huge loss," Abe was quoted by the Foreign Ministry as telling Macron. The Japanese government will consider providing support if requested by the French government, Chief Cabinet Secretary Yoshihide Suga told a news conference after the fire at the World Heritage site on Monday that burned through its roof and caused the building's 90-meter spire to collapse. Japanese celebrities conveyed their sadness at the tragedy. Award-winning actress Keiko Kishi, a Paris resident noted for her role in the 1983 film "The Makioka Sisters" (Sasameyuki), said, "Notre Dame is a symbol of Paris. I often took walks by the banks of the River Seine and passed by the cathedral." Actor Kanji Ishimaru, the Japanese voice of protagonist Quasimodo in Disney's animation "The Hunchback of Notre Dame," said "The cathedral has been an important presence in my life as an actor, and I've visited it a number of times." "Watching clips of the blaze saddened me deeply. I hope reconstruction begins as quickly as possible," he added. 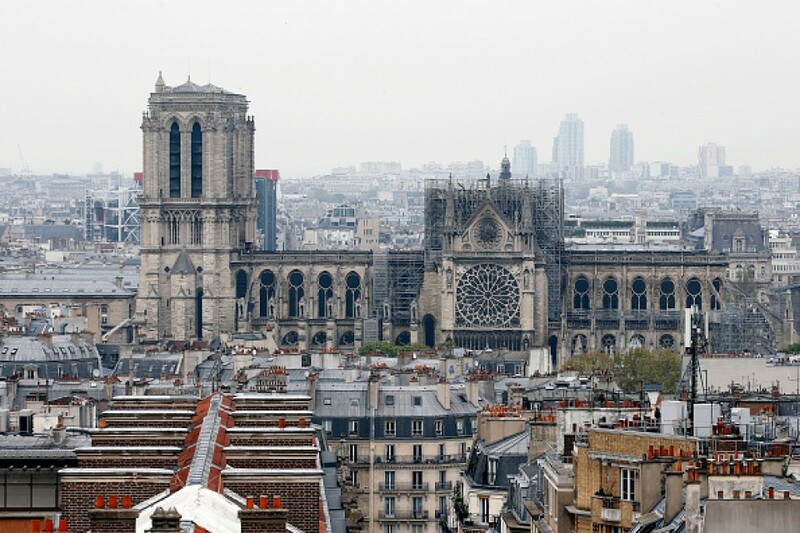 Kyoto Mayor Daisaku Kadokawa sent his best wishes to Paris Mayor Anne Hidalgo, saying he hopes the cathedral can be rebuilt to its former glory. Kyoto and Paris have been sister cities since 1958. Yuta Naiki, who regularly hosts French language and cultural exchange events at a Tokyo cafe he manages, said "Notre Dame is a symbolic presence, even among the many churches in the city." Miki Kato, daughter of renowned shogi player Hifumi Kato and the head of the Catholic research center at Sendai Shirayuri Women's College, also expressed her sadness, having visited Notre Dame just last month. "Its magnificence is unlike any other church, and the many visitors and locals praying there left an impression on me," she said. Noting that Notre Dame held a service for victims of the 2011 earthquake and tsunami that hit Sendai and other areas of northeastern Japan, Kato said "It is now our turn to support France. I pray for (the cathedral's) recovery." The church is among the most famous landmarks in Paris. Located on a small island in the River Seine, the church was completed in 1345 and has been the site of numerous historical events, including the French Revolution of 1789 when it suffered vandalism and the coronation of Napoleon Bonaparte in 1804.